When it comes to honoring and thanking our nation’s veterans, taking part is a no-brainer. So, we’re sure it only seemed natural for founder and CEO Mr. Davison to take part in an upcoming event to honor our region’s veterans. 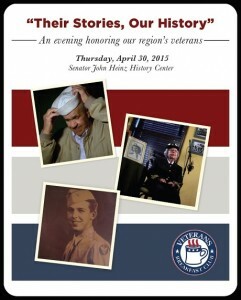 On April 30th, the Veterans Breakfast Club is hosting an evening called “Their Stories, Our History” at the Senator John Heinz History Center in Pittsburgh. The event will celebrate the opening of the Veterans Breakfast Club’s new Western Pennsylvania Veterans Archive at the center and we’re pleased to say that Davison will be included as one of the evening’s sponsors. A belated thank you for kindly sponsoring our April 30 event at the Heinz History Center. I look forward to being in touch with details close to the date. It will be a great event! The mission of the Veterans Breakfast Club is to give each and every veteran an opportunity to share their unique story. If you would like to take part in an event where you can celebrate our nation’s veterans and listen to some of their stories, reserve a ticket for the April 30th event here. Learn more about the Veterans Breakfast Club here. Davison App Sparks Consumer Excitement!